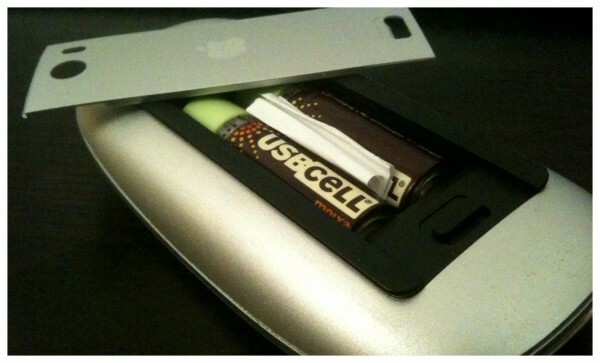 If you’re experiencing frequent Magic Mouse disconnects with your Mac, try shoving a folded piece of paper between the batteries and battery door. Don’t put so much paper that you’ll warp your door outwards, but just enough so that your batteries stay snug and in place at all times. This should help to alleviate an issue that some users (myself included) have been experiencing whenever they accidentally lift their Magic Mice off the desks. The theory is that the batteries inside can get jolted and turn the mouse off for just long enough to disconnect it, requiring a silly little 10 second wait before you can power up and reconnect to your Mac. I tried this trick out last night and it seems to be working out just fine. I absolutely cannot guarantee that nothing will go wrong here — you are putting paper beside active batteries — but I figure the Magic Mouse doesn’t heat up and doesn’t use very much power at all, so it should be alright (but expect to hear from me again if I have any problems). You are my hero. Two thumbs up!